Like attractive design? Need a spacious interior? Want modern technology, but don’t want to break the bank? Say hello to the Dacia Sandero. The Dacia Sandero’s incredibly low price tag shouldn’t be viewed with suspicion. 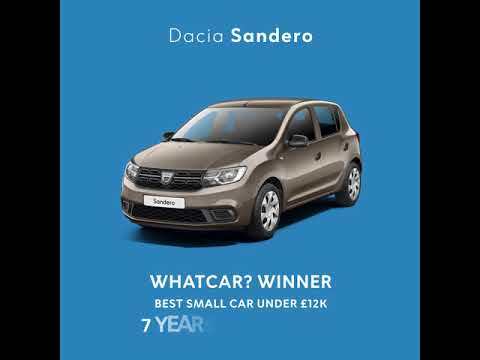 The award-winning Dacia Sandero Ambiance is reliable to a fault, seats five adults and is a real winner when it comes to running costs. The Dacia Sandero 0.9 TCe Essential Offer can achieve combined fuel consumption as high as 53.3mpg to bring your fuel bill down. The manufacturer’s no-frills approach to vehicle design is the reason for the car’s low price, yet it has all you need to enjoy any journey. The core features include power-assisted steering for effortless parking manoeuvre, daytime running lights so other motorists can always see you, and a gear shift indicator so you know the most efficient time to change gear. With the Access trim you can fit a radio and speaker system as an accessory, a feature which comes as standard. Head to our Dacia used car page to explore a wide stock of pre-owned Dacia Sandero cars at even lower prices. To test drive these vehicles, a brand new version, and for more on our offers, simply enquire with our Newport showroom.